Who Has a Shot to Strike Lightning? On September 27th, the Tampa Bay Lightning made a gigantic cut to their training camp roster, reducing it from 64 to 36 players, reassigning 25 to Syracuse Crunch, their AHL affiliate, 2 back to junior and releasing one form tryout. That leaves 13 players left to be cut before their season opener on October 9th. The full list of cuts can be seen here. Some surprises to be already cut include a couple of 2012 1st round picks, Slater Koekkoek back to AHL, along with Andrei Vasilevskiy, who had a sensational preseason. Also, 2013 2nd round pick, Adam Erne, and 2014 1st round pick, Athony DeAngelo, were both sent back to junior fairly quickly. There are a few frontrunners to make the final regular season roster. These few include Vladislav Namestnikov, Brett Connolly, Jonathan Marchessault, and of course, Jonathan Drouin, although he is out. Let’s take a look at each of their chances to crack the Lightning. Drouin was an early favourite to win the Calder Trophy this year, as top rookie, after unexpectedly being sent back to junior last year. 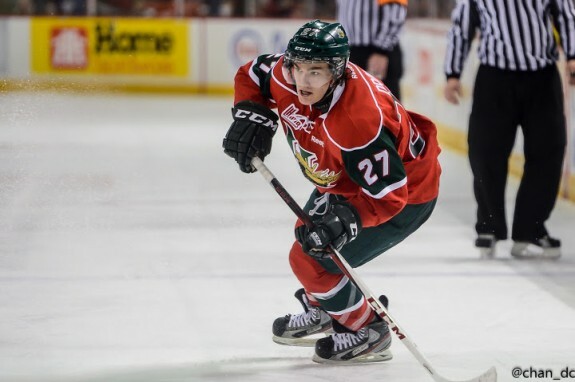 He put up huge numbers in the QMJHL with the Halifax Mooseheads. Totalling 29 goals and 79 assists for 108 points in just 46 games. In the playoffs, he put up a ridiculous 13 goals and 28 assists for 41 points in only 16 games. NHL.com also rated him the #1 prospect in the league. However, in training camp, Drouin slightly fractured his thumb. He fell awkwardly in rookie camp on his hand. Of the injury, Drouin said, “It wasn’t a big hit or anything, I just lost balance and fell on my hand. I felt really good on and off the ice when I showed up in camp,” Drouin said. “To miss the first part of training camp and preseason, it’s disappointing.” The Lightning have said that when Drouin returns, he will have every opportunity to stick with the team. Here’s hoping the rehab goes well and he can still put up a great season, as was expected. Jonathan Drouin could be a future Calder Trophy winner and dream linemate of Steven Stamkos, once he returns. Vladislav Namestnikov was the 27th overall pick in 2011 from the London Knights of the OHL. However, he’s spent the past 2 seasons with the Syracuse Crunch of the AHL, putting up impressive numbers. Last year, he had 19 goals and 29 assists for 48 points in 56 games, good for 2nd on the team. In training camp this year, Namestnikov has impressed with his speed and NHL quality shot. In preseason, he put up 3 assists in a 4-2 win, his only appearance thus far. The Lightning have said they’re very comfortable having Namestnikov as a injury call up or an extra forward already. In 4 NHL games last year, he had 0 points and 4PIM. 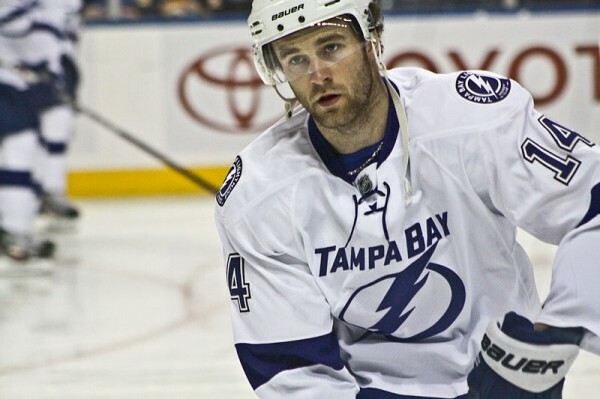 Brett Connolly is hoping 2014-15 is the year he can stick with the Lightning for good. Connolly was the 6th overall pick in 2010, but has yet to find a full time spot with the Lightning. Last year, he spent 11 games in Tampa scoring one goal. The rest of his time was spent with Syracuse where he scored 21 goals and 36 assists for 57 points in 66 games, leading the team in points. Connolly may have a head up on the rest of the guys here due to the fact that he, maybe, should already be at the NHL level. The Lightning played Connolly the entire first year in NHL, perhaps before he was ready, which may have hindered his progression and development. Look for them to give him another shot right away this October. The Lightning acquired Marchessault from the Columbus Blue Jackets in a trade involving Dana Tyrell. He totalled 23 goals and 33 assists for 56 points in 77 games last year. His time was split with the Springfield Falcons (56 games) and Syracuse Crunch (21 games). Marchessault didn’t have huge expectations placed on him, but he is definitely making it difficult to send him back down to AHL. So far this preseason, he has 2 goals and 2 assists in his 2 appearances. Despite his small size, he is a gritty player who is in on every play. He has been a solid playmaker in 3 years of pro hockey, and perhaps the Lightning will reward him with a shot to stick in the NHL. Whoever sticks with the big club this fall will be put into a great environment with several leaders and guys who have recently had hugely successful rookie years. The pool is deep for the Lightning, who finished 2nd in their division last year. Expect great results from this team in the very near future, likely with many, if not all, of these 4 promising youngsters having an impact on the team’s success. Feel free to discuss the Lightning’s prospects in the Comment section below!